As soon as the deposit was paid, Jet Tern started the build process of our new Selene straight away. 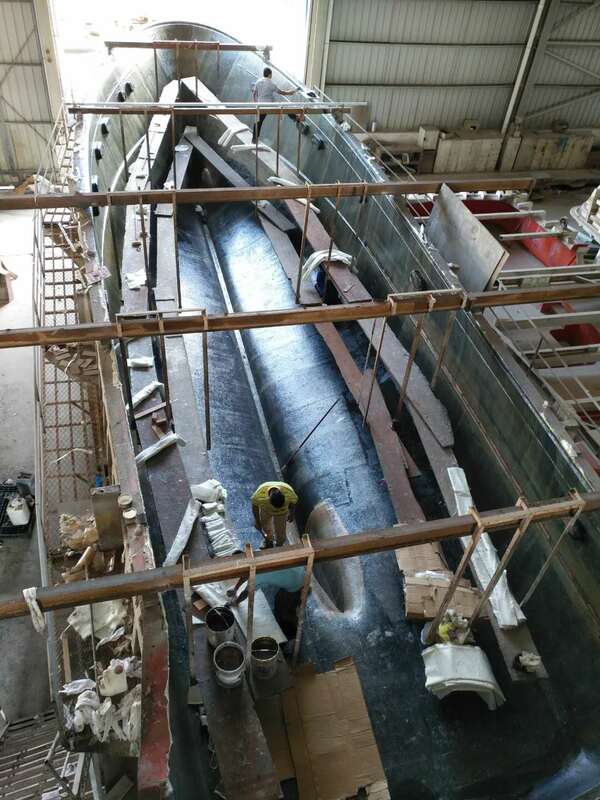 They prepared the mould for the classic Selene 60 Trawler and laminating began. One of our key requirements has always been – no white boat! However, this is a pretty expensive “red line” and there’s always a discussion about how best to get a coloured hull. Do you lay it in the hull as the gel coat layer or do you paint it afterwards? 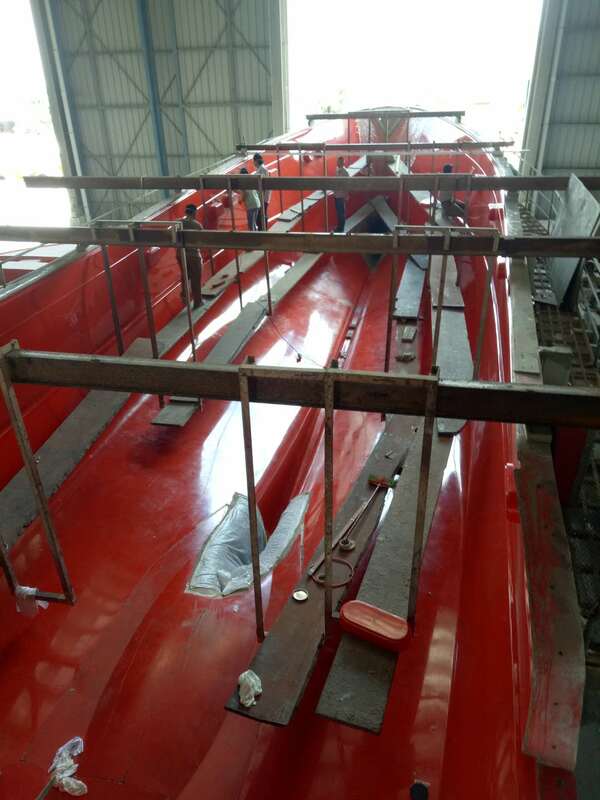 For a large boat, painting is considered the best option – and everyone recommends also that you don’t paint for the first couple of years. It’s better to allow the FRP to settle and cure fully to avoid blistering. Over time a gel coat layer dulls and is more difficult to maintain and repair the odd knocks and scratches that inevitably happen so painting is the way to go. Jet Tern are not keen on painting at the factory. Although an Awlgrip painted hull is one of the standard options, the huge sheds they used to do this were damaged in a storm so they are struggling to do this in the proper environment. For this reason, as well as the general recommendation of delaying painting, they prefer clients to arrange this after delivery. This was a bit disappointing for me. The boat just doesn’t look the same in white but I didn’t have much choice and she would end up being blue eventually! However, during the initial specification discussions it turned out that Jet Tern had some stock of a light grey gel coat which they could provide at no extra cost. It’s a very light grey, so may not look much different to white in the end but we were pleased to accept this as a better interim solution. Our current sailboat is grey – and I love that – so grey or blue are equally good in my opinion! So – they sprayed grey gel coat on the mould, followed by layers of fibre-glass and lamination. Next, they applied a barrier coat to ensure the end quality of the gel coat and to avoid the fibre glass layers showing through. 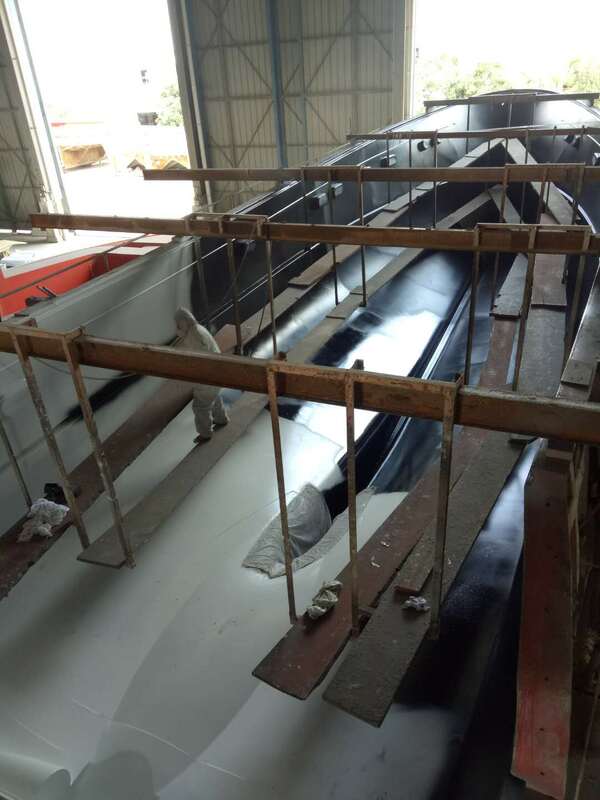 Gradually, the lamination team built up the hull, layer by layer – and then they vacuum compress to give a thin but very strong FRP structure. Inside, the reinforcement structure was built on top and laminated. The end result is the strong hull that is needed for an ocean going trawler. A “gestation” period of a few weeks followed completion of the construction and our baby lay in the mould curing – ready for the planned release when we visit in July. During May and June, we got acquainted with WeChat – which seems to be how every Chinese person runs his life 🙂 It’s the Eastern equivalent of WhatsApp – and the whole factory runs using it! Howard set up groups for the production team and the design team and we are now in touch directly with the guys on the shop floor. Everyone has their mobile glued to them, much like we see in the West – only I think they are even more obsessed with their phones than we are. 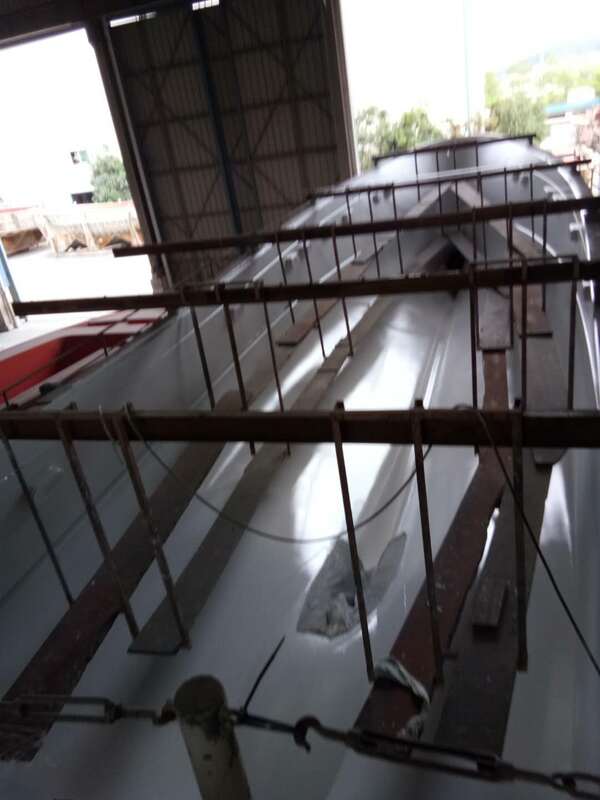 The guys who were actually building our new Selene sent us photos almost every day throughout the initial hull laying process so we could see it come to life in real time. We were also exchanging ideas, pictures and web sites with the design team at the same time to get together the initial specification for the interior and equipment. Of course, we both now have yet another social media app to follow – but it’s great to wake up each morning and see the boat developing while we slept! Looking forward to the trip to China and seeing our new Selene for real!